This park report is from October 10th (Fri), the day Gelatoni’s halloween costume, plush strap and badge were released. Also, the tote bag was finally re-released as well! I was there on my own that day and all pictures were taken with my phone, so I apologize for the low quality photos! 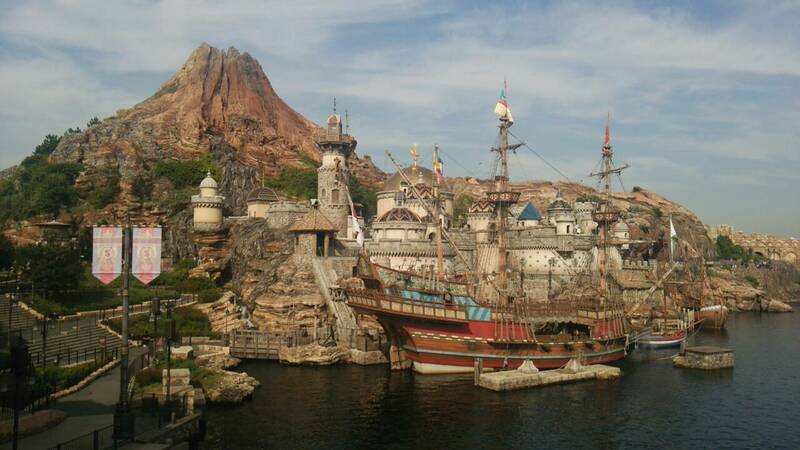 I arrived a little before 7 AM this time and headed over to DisneySea on the Resort Liner. It was about 7:15AM by the time I arrived and the lines were stretched past the ticket booth roof! I was 4th in line for the gate the day before so I was definitely caught off guard. But, I realized that I should have expected this since it was the first day of merch. I took my place in line and within the next 20 minutes or so the line finally moved forward. As always, hotel guests were allowed entry 15 minutes before opening time and it may just have been me, but it felt like everyone was running a little faster than usual. I was able to enter the park within a few minutes of opening and made my way towards Aunt Peg’s Village Store. The lines for Galleria Disney and McDuck’s Department Store were already astonishingly long and growing at a fast rate. I later learned that the lines for both shops were 2 and 3 hours long respectively at that point! The line for McDuck’s stretched around the harbor at one point, reaching close to Il Postino Stationery, almost half way around the harbor! Surprisingly and luckily, the line for Aunt Peg’s was not long at all! It was the furthest Duffy store from the gate, but it was definitely worth the long walk! I’m so glad I didn’t get spooked and jump into the line for one of the stores near the harbor! I arrived a little bit before 8:15AM and was in the shop within 20 minutes. Once I was in the store it was chaos! I had no chance to take a photo. I quickly found the Gelatoni section and wedged my way through the sea of guests. Just as I reached the shelf the last halloween costume was snatched off the hook and I was devastated. After waiting a few minutes and hoping a cast member would come to my rescue and restock the shelf (to no avail), I scanned the tiny shop and found another shelf with Gelatoni costumes and straps. After another session of trying to push through the jam packed crowd I finally reached the second display and managed to get the number of costumes that I needed. I had not planned on buying a strap, but the combination of seeing people grab them up and the thought of all the effort I had put in to be there caused me to reach out and get one for myself! The longest line I stood in that day (other than waiting for the opening) was actually for the register. I was perhaps in line for the register for a good half hour. There were multiple lines wrapping around the island of registers in the middle of the shop and the ones near the entrance as well. All around me, people were pushing and trying to get to the Gelatoni merchandise. Cast members were rushing to restock the shelves over and over again. Total chaos. It was actually really refreshing to see a little girl bounce in with her parents and head for the Shellie May display.